YANGON – I was among 14 local journalists who joined a two-day government guided tour of northern Rakhine’s Maungdaw district last week following accusations from international rights groups that the government was orchestrating a campaign to bulldoze the remnants of Rohingya settlements in the area to clear evidence of official wrongdoing. The authorities scheduled a media tour of several villages including Pan Taw Pyin Muslim village, located on the outskirts of Maungdaw, the Hla Phoe Khaung refugee reception camp, and Inn Din village, where two Reuters reporters exposed mass graves, as well as Taung Pyo Let Wei town. All these villages had been previously visited by diplomats and foreign correspondents. As usual, district officer U Ye Htut fielded questions from journalists at his office on Saturday and said that about 10 villages had been bulldozed to make way for construction of new settlements and border police regiments, while 13 village tracts out of a total 93 villages in the whole district remained intact following the late 2017 violence. But he did not provide a breakdown of how many of these were Arakanese or Rohingya villages. The UN has described the army’s campaign against the Rohingya as a textbook example of ethnic cleansing while international rights defenders have called for high-ranking officers from the Myanmar military to be brought before the International Criminal Court. U Ye Htut claimed that some Muslim villages such as Ngan Chaung, Kyae Taw Pyin and Nga Sar Kyu in northern Maungdaw had not suffered arson attacks and that the residents in almost all of them had been living peacefully despite the violence that erupted in the area. Some reporters demanded to be taken to those locations as a matter of clarification, however the government administrative department official took them to see only one village, Ngan Chaung, which is about 27 kilometers from of the district’s urban center. They were not, however, allowed to visit Nga Sar Kyu village, which is situated on the same route and only about 4 kilometers from Ngan Chaung village. We saw an infantry checkpoint (Light Infantry Battalion No. 535) near Maung Hna Ma village on Sunday morning. I visited that village alone after the Oct. 9 attack in 2016 and observed that within a few months farming had been revived and commodities were being sold again in the market but it had been razed in the late 2017 violence and no one was living there now. We then arrived at Ngan Chaung village, which is home to a decades-old white Muslim mosque that sits between two freshwater lakes. The atmosphere was completely silent as our motorcade pulled up there. Some elderly and male Rohingya came out to greet the vehicles. There were noticeably no women among the group. Reporters were allowed to interview different sources for 10 minutes, and to take photographs. Most of the residents, however, were reluctant to speak with the journalists as the government officials, police and special police branch officers were close by photographing them. 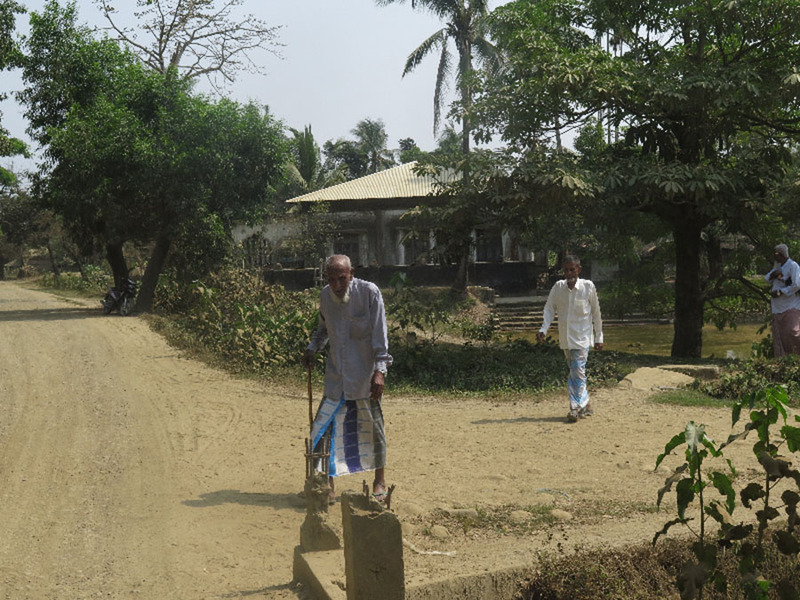 The village once had a population of about 5,300 residents but nearly 5,000 have now fled to neighboring Bangladesh amid fear they will be detained by security forces. Some of the 700 Rohingya still living in Ngan Chaung said they had decided to stay because it had been their home their whole lives. “I grew up here and this is my native place. Why should I flee to another country as I have done nothing wrong?” said one man who asked to remain anonymous. Another Muslim man complained that he was arrested by border police for visiting neighboring Kyae Pin village without a recommendation letter from his village head and fined about two lakhs (200,000 kyats). The Irrawaddy asked the Rohingya village head, U Thin Ko Ko, about the detention claim and he denied it happened. A few days later he acknowledged, however, that everyone in the village is required to have a travel permit, regardless of whether the villagers had their own proper tri-fold card, or national verification card (NVC). Multiple Muslim sources from Maungdaw described the villagers’ situation in the surrounding urban areas as being similar to house arrest. In fact, NVC holders were granted freedom of movement in Buthidaung and Maungdaw townships in early 2017. During the trip, a district administrative officer proudly told the journalists that NVC cardholders were even allowed to travel to Yangon to apply for a passport. Along the highway of northern Maungdaw Township, we repeatedly witnessed burned-out sites, dry betel nut trees, piled-up coconut timber, the dug-up roots of raintrees, skinny dogs, villages that had been recently bulldozed to make way for new border police regiments or for new villages and a few Rakhine villages with police stations. 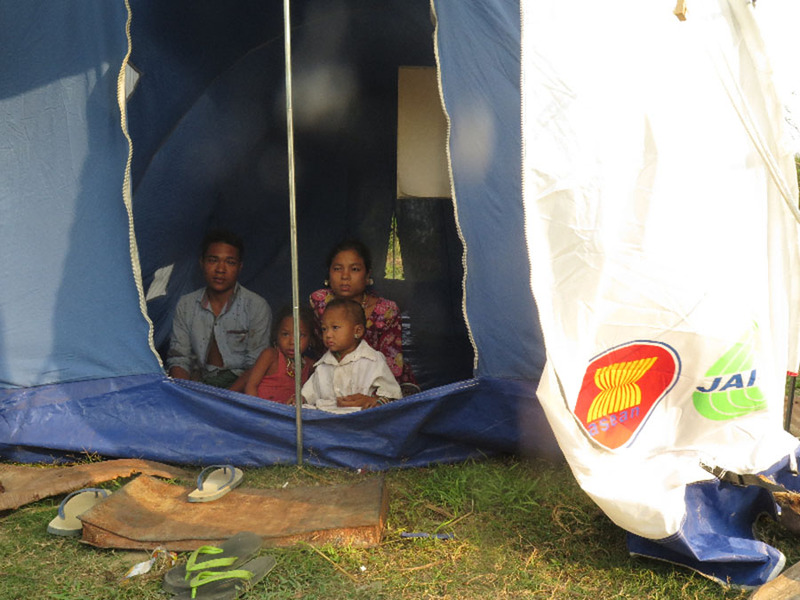 Our group was also brought to meet 60 families who had recently fled from Bangladesh’s Bandarban hills district to Kha Maung Seik town’s Oh Tan village, which is 53 kilometers from Maungdaw. 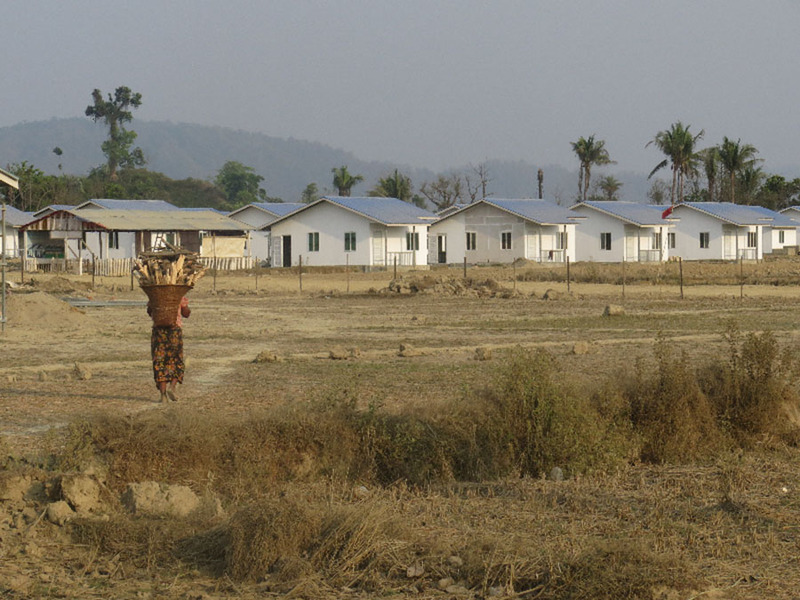 Some modest brick houses have been built on the top of burned Rohingya villages while some of the displaced 43 Hindu households are now encamped near Mayu Mountain. Some of the ethnic Mro from the Bangladesh side can speak Arakanese. U Pun Num, a 40-year-old father of four, was one of them. He explained the Mro are officially recognized as Bangladesh citizens and have national identity cards but can’t read the Bangla dialect. The tribespeople subsist by means of shifting cultivation and farming in the hill tract region and are predominantly Buddhist. Reports about the Rohingya exodus in late 2017 have created hostilities between the Chackma and Mro and neighboring Muslim villages, as it was widely believed in majority Muslim Bangladesh that the Mro were the same as the Buddhist Arakanese and responsible for the plight of the Rohingya. “Although we were not physically assaulted, it could happen one day and I felt we were not safe there,” U Pun Num said. To reach Kha Maung Seik village, the tribespeople had trekked for six days from Bandarban district and did not see any border guards near the frontier fence on either the Bangladesh or Myanmar side. 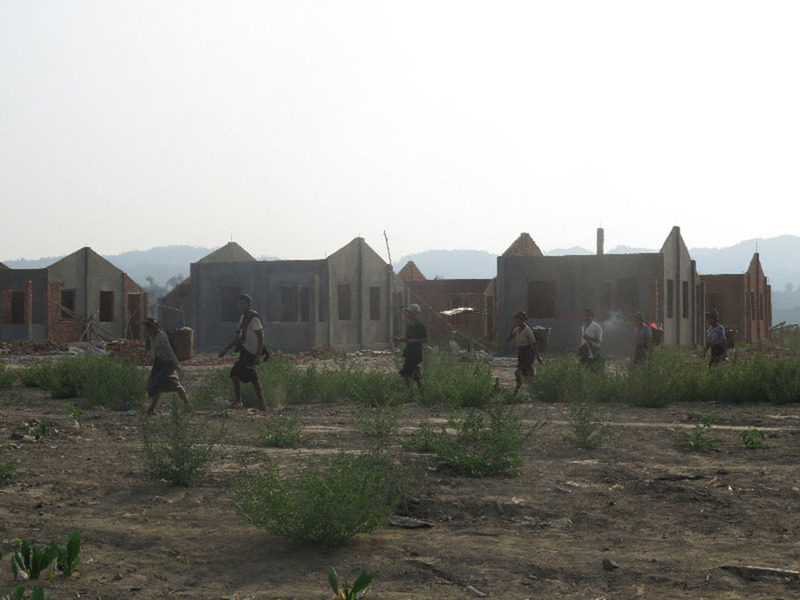 According to Kha Maung Seik town authorities, the newly constructed houses are intended for the tribespeople. Border crossings and citizenship claims could turn out to be the most complex part of this issue. During the trip, immigration officers told reporters that they couldn’t issue citizenship cards to ethnic Mro who came from Bangladesh. But, meanwhile, the government has been constructing buildings for the new arrivals. The authorities’ position on this matter is obviously questionable, given the NVC holders or displaced Rohingya are restricted from travelling and even going shopping in downtown areas while the new arrivals from Bangladesh are allowed to move freely within the area. The clear lack of law enforcement in the region could also fuel distrust between the Muslim and Buddhist communities. I have travelled across southern and northern Maungdaw and seen many unlawful activities being carried out by uneducated villagers, such as the looting of the burned remains of Muslim villages and the cutting down of trees for lumber. None of this is new in the conflict zone, and has been happening since September 2017. A couple of days after we arrived back in Yangon from Maungdaw, an ethnic Mro woman was hacked to death by unidentified men near a Muslim village where eight Mro villagers were searching for plants to cook. Some Hindu sources told The Irrawaddy that the Mro entering the burned-out site was the cause of the incident.